Jeremy Jorns of Sevastopol has been riding high since taking first place at the Brillion invitational to start the season. He’s eyeing a return to the state tournament. Submitted. Finishing a season 32-3 and ranking second in the state would be quite satisfying for most high school wrestlers, but for Sturgeon Bay-Sevastopol’s (SBS) Jeremy Jorns, it’s a small accomplishment on the proverbial road to redemption. Jorns qualified for the Wisconsin Interscholastic Athletic Association Division 2 state tournament last year, and he admits that he let the grand stage in Madison get to him. 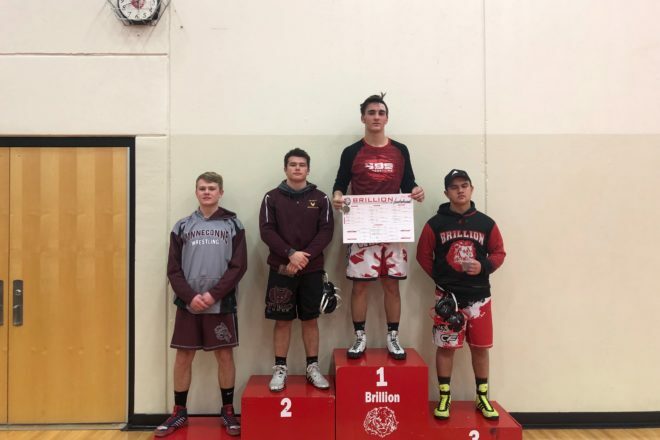 Two losses by a combined score of 16-2 left him with a pair of goals: to return to the state tournament and to prove he belongs in a class with the state’s top wrestlers. His quest will begin Saturday, Feb. 9, when he wrestles at 182 pounds in the Division 2 Valders Regional. Despite nursing a neck strain that forced him to miss some action late in the season, Jorns has been dominant, winning four invitationals and placing second in two others. His three losses have gone to Dodgeland’s Ryan Neu (top-ranked at 170 in Division 3), Edgar’s Brock Handrick (ranked third at 182 in Division 3) and Kewaunee’s Travis Reinke (fifth-ranked at 170 in Division 3). Jorns split two matches with Reinke, winning the first 1-0 but dropping the second 5-3. Jorns said there is a lot of pressure on him going into the postseason, but he will use that pressure as motivation. He added that a change in mindset has served him well this season.